acne myths. Acne scar skin care often tends to be clinical and quite abrasive. That's why it is wonderful that we are able to offer you a treatment for your skin. And it really is something special. I have seen this cream do remarkable things. My sister Tash, had terrifying acne as a teenager mainly due to the fact that she was never out of the swimming pool and the chlorine irritated both her skin and her sinuses. It really was fierce and always looked really hot and angry. I have to say we never really got on as kids, (that's a tad understated !) but even then I used to feel sorry for her about it. I was a godsend to her I think when she used this range. I think that if you or your teenagers have acne, you will be amazed at how well it works, but more than that how gentle it is. The antibiotic qualities heal the infection quite quickly so it attacks the root cause. The moisturiser is a hydrogenating base so it won't lather on loads of oil and grease, it just gently cools all that heat down with the water in it. Of course, the fact that it stops the skin from scarring is fantastic in itself. I think I should point out that most acne treatments smell clinical and harsh, this is delicious. The fact that oils absorb through the skin though, means that the fragrance disappears pretty much immediately. So...boys, don't worry, you won't smell all flowery! Now you have picked your base...lets go back to the order page and enter the numbers of the formulae that you require. 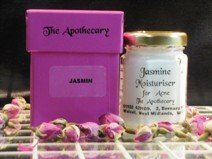 Jasmin oil is in many of our other ranges apart from the acne products for sensitive skin. Click here to find out more.